Geneviève Bujold (born 1 July 1942) is a Canadian actress. She is best known for her portrayal of Anne Boleyn in the 1969 movie Anne of the Thousand Days. Bujold was born in Montreal, Quebec, into a Catholic French Canadian working-class family. She received a strict convent education for twelve years. After that, she entered Montreal's Conservatoire d'art dramatique. There she was trained in the great classics of French theatre. She made her stage debut as Rosine in Beaumarchais' Le Barbier de Séville in 1962. Bujold got her first major break in 1965, while on a theatrical tour in Paris. She was noticed by French director Alain Resnais, who offered her a role in his movie La guerre est finie, opposite Yves Montand. This led to her staying in France for a time. There she appeared in two other movies: Philippe de Broca's Le Roi de Coeur, opposite Alan Bates, and Louis Malle's Le voleur, opposite Jean-Paul Belmondo. Back in Canada, Bujold married screenwriter/director/producer Paul Almond in 1967. She starred in three of his movies; Isabel (1968), The Act of the Heart (1970) and Journey (1972). She won the Canadian Film Award for best actress for the first two. The couple divorced in 1973, but worked again together in Final Assignment (1980) and The Dance Goes On (1991). The latter also featured their son Mathew Almond (born in 1968). Bujold appeared in Michel Brault's Entre la mer et l'eau douce (1967). She appeared in Claude Jutra's Kamouraska (1973), and won her third Canadian Film Award for best actress for that role. Bujold made notable appearances on American television (Hallmark Hall of Fame, NBC) in George Bernard Shaw's classic plays; Saint Joan in 1967, and Caesar and Cleopatra in 1976, the later opposite Sir Alec Guinness. She also appeared in Jean Anouilh's Antigone in 1974 (Great Performances, PBS). 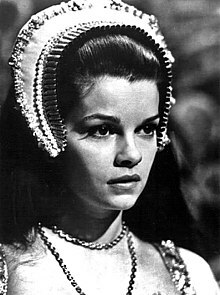 International recognition came in 1969, when Bujold portrayed Anne Boleyn in Charles Jarrott's movie Anne of the Thousand Days, opposite Richard Burton's Henry VIII. Her performance won her the Golden Globe Award for best actress in a leading role and an Academy Award nomination in the same category. The following year, she played Cassandra in Michael Cacoyannis's movie version of The Trojan Women, opposite Katharine Hepburn, Vanessa Redgrave and Irene Papas. Bujold is fluent in both French and English. She has worked steadily in the United States, Canada and France. Notable movies have included; Earthquake (1974), L'incorrigible (1975), Swashbuckler (1976), Obsession (1976), Another man, another chance (1977), Coma (1978), Murder by Decree (1979), Monsignor (1982), Tightrope (1984), Choose Me (1984), Dead Ringers (1988), The Moderns (1988), Les noces de papier (1989), Mon amie Max (1994), The House of Yes (1997), Eye of the Beholder (1999), Finding Home (2003), etc. In 1994, she was chosen to play the lead character in the popular television series Star Trek: Voyager. She made headlines when she quit after the first episode, finding the shooting schedule too demanding. Geneviève Bujold has lived in Malibu, California, since 1974. She has a second son, Emmanuel (born in 1980), with companion Dennis Hastings. Wikimedia Commons has media related to Geneviève Bujold. The Canadian Film Encyclopedia, The Toronto Film Festival Group, November 2007. This page was last changed on 6 August 2018, at 04:35.